Astronomers using ALMA and NOEMA have made the first definitive detection of a radioactive molecule in interstellar space. The radioactive part of the molecule is an isotope of aluminium. 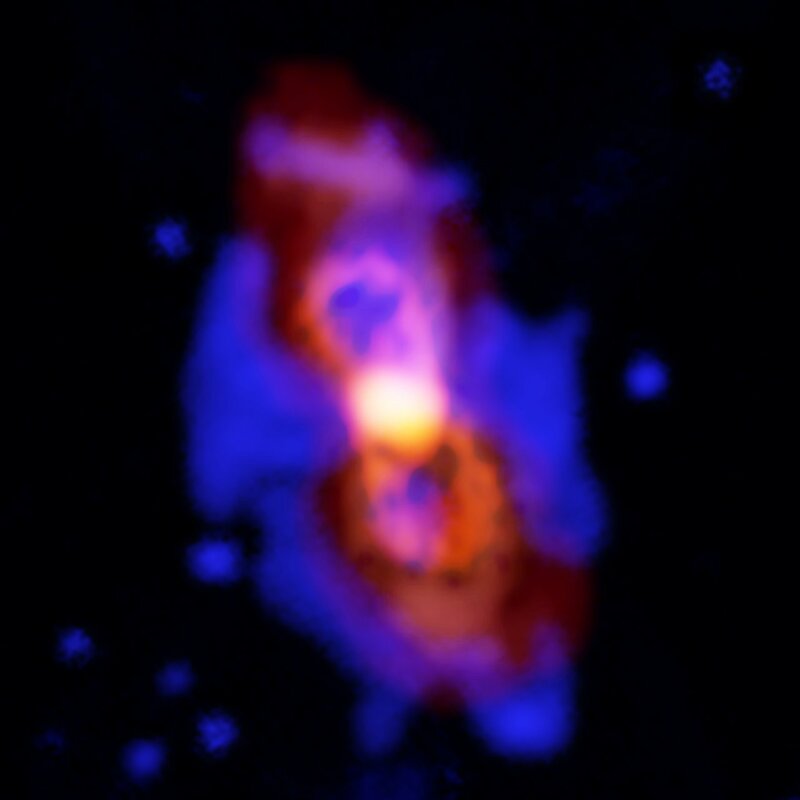 The observations reveal that the isotope was dispersed into space after the collision of two stars, that left behind a remnant known as CK Vulpeculae. This is the first time that a direct observation has been made of this element from a known source. Previous identifications of this isotope have come from the detection of gamma rays, but their precise origin had been unknown. The team, led by Tomasz Kamiński (Harvard-Smithsonian Center for Astrophysics, Cambridge, USA), used the Atacama Large Millimeter/submillimeter Array (ALMA) and the NOrthern Extended Millimeter Array (NOEMA) to detect a source of the radioactive isotope aluminium-26. The source, known as CK Vulpeculae, was first seen in 1670 and at the time it appeared to observers as a bright, red “new star”. Though initially visible with the naked eye, it quickly faded and now requires powerful telescopes to see the remains of this merger, a dim central star surrounded by a halo of glowing material flowing away from it. Previous identifications of this isotope have come from the detection of gamma rays, but their precise origin had been unknown. <<Aluminium-26, 26Al, is a radioactive isotope of the chemical element aluminium, decaying by either of the modes beta-plus or electron capture, both resulting in the stable nuclide magnesium-26. The half-life of 26Al is 717,000 years. This is far too short for the isotope to survive to the present, but a small amount of the nuclide is produced by collisions of argon atoms with cosmic ray protons. Aluminium-26 can be used to calculate the terrestrial age of meteorites. After the breakup of the meteorite parent body, it will be bombarded by cosmic rays, which will saturate it in aluminium-26. After falling to earth, 26Al production ceases, which means that the amount of 26Al in the sample can be used to calculate the date the meteorite fell to earth. Aluminium-26 also emits gamma rays and X-rays. The x-rays and Auger electrons are emitted by the excited atomic shell of the daughter 26Mg after the electron capture which typically leaves a hole in one of the lower sub-shells. Because it is radioactive it should be stored behind at least 5 cm of lead and special tools should be used for transfer, use, and storage. Fascinating. So the explosive stellar merger that created CK Vulpeculae was a sort of supernova explosion, then? Or at least a nova that "killed" the parent stars? Or is CK Vulpeculae still a functioning star, just like other stars that have been rocked by nova outbursts? Fascinating. So the explosive stellar merger that created CK Vulpeculae was a sort of supernova explosion, then? Or at least a nova that "killed" the parent stars? Or is CK Vulpeculae still a functioning star, just like other stars that have been rocked by nova outbursts? The explosive stellar merger that created CK Vulpeculae is assumed to be a luminous red nova with a brightness between that of a supernova (which is brighter) and a nova (dimmer). CK Vulpeculae is still a functioning star trapped within a cold bi-polar nebulous blob. <<CK Vulpeculae may be the oldest cataloged nova variable. It consists of a central dim object with gas flowing out (~ 210 kilometres per second) into a bi-polar nebulous blob. It is either inside of a cloud of cold (~ 15 K) dust or the cloud is in front of it from the Earth's perspective. Molecular gas in the vicinity is rich in nitrogen relative to oxygen. CK Vulpeculae was discovered on June 20th 1670 by Voituret Anthelme and independently on July 25 by Johannes Hevelius. It had a brightness maximum of approximately magnitude 3 at its discovery after which it faded. A second maxima of approximately 2.6 magnitude was observed in March 1671, after which Johannes Hevelius and Giovanni Cassini observed it throughout spring and summer until it faded from naked-eye view in late August 1671. A last weakly visible brightness maxima of approximately 5.5 to 6 magnitude was observed by Hevelius in March 1672 and finally faded from view late May. <<A luminous red nova (abbr. LRN, pl. luminous red novae) is a stellar explosion thought to be caused by the merging of two stars. They are characterised by a distinct red colour, and a light curve that lingers with resurgent brightness in the infrared. The luminosity of the explosion occurring in luminous red novae is between that of a supernova (which is brighter) and a nova (dimmer). The visible light lasts for weeks or months, and is distinctively red in colour, becoming dimmer and redder over time. As the visible light dims, the infrared light grows and also lasts for an extended period of time, usually dimming and brightening a number of times. A small number of objects exhibiting the characteristics of luminous red novae have been observed over the last 30 years or so. The red star M31 RV in the Andromeda Galaxy flared brightly during 1988 and may have been a luminous red nova. In 1994, V4332 Sgr, a star in the Milky Way galaxy, flared similarly, and in 2002, V838 Mon followed suit and was studied quite closely. Thanks, Art! Yes, CK Vulpeculae made me think of 838 Monocerotis, and to my knowledge, 838 Mon is not considered a dead star. I asked because the headline talked about CK Vulpeculae as a "stellar corpse". The luminosity of the central object, estimated from infrared dust emission, is about 0.9 L☉. The luminosity required to energize the observed nebulosity is calculated at 3 L☉ from an object at 60,000 K. At the time of its eruption, the luminosity of CK Vulpeculae is calculated to have been at least 24,000☉. Known ionic emission lines in the spectrum, and unidentified absorption features in the infrared indicate a temperature between 14,000 K and 100,000 K.
Let's see. The luminosity of the central object is calculated to be either 0.9 L☉ or 3 L☉. We are talking of an object of moderate brightness. But the object sure is hot, hotter than (almost) any known O-type pre-supernova star. Since it is the remnant of a merger that took place a couple of hundred years ago, and the merger product has been cooling ever since, it could, if we just consider its post-red nova luminosity and temperature, theoretically be a faint white dwarf of some sort and therefore actually dead. Are we sure it isn't? CK Vulpeculae made me think of 838 Monocerotis, and to my knowledge, 838 Mon is not considered a dead star. I asked because the headline talked about CK Vulpeculae as a "stellar corpse". The luminosity of the central object is calculated to be either 0.9 L☉ or 3 L☉. We are talking of an object of moderate brightness. But the object sure is hot, hotter than (almost) any known O-type pre-supernova star. Since it is the remnant of a merger that took place a couple of hundred years ago, and the merger product has been cooling ever since, it could, if we just consider its post-red nova luminosity and temperature, theoretically be a faint white dwarf of some sort and therefore actually dead. Are we sure it isn't? Re: Better red than dead? Of course I wouldn't compare CK Vulpeculae with Sirius B or Procyn B, but these two degenerate dwarfs are "old" white dwarfs. At least I'm sure they are very much older than CK Vulpeculae, which can't be more than some 400 years old or so. A white dwarf is very hot when it forms, but because it has no source of energy, it will gradually radiate its energy and cool. The visible radiation emitted by white dwarfs varies over a wide color range, from the blue-white color of an O-type main sequence star to the red of an M-type red dwarf. White dwarf effective surface temperatures extend from over 150,000 K to barely under 4,000 K. In accordance with the Stefan–Boltzmann law, luminosity increases with increasing surface temperature; this surface temperature range corresponds to a luminosity from over 100 times the Sun's to under 1/10,000 that of the Sun's. Sirius B is one of the more massive white dwarfs known. With a mass of 1.02 M☉ it is almost double the 0.5–0.6 M☉ average. This mass is packed into a volume roughly equal to the Earth's. The current surface temperature is 25,200 K.
With a surface temperature of 7,740 K, it is also much cooler than Sirius B; this is a testament to its lesser mass and greater age. I just thought that a luminosity of 3 L☉ and a temperature of 60,000 K might be appropriate for a 400-year-old white dwarf. ...so it does sound like a white dwarf. I guess I just take offense in us degenerate retired white guys being considered "dead." I was about to say that CK Vulpeculae might be a stellar gal instead, but I guess not. I'd say the star's full name is C(lark) K(ent) Vulpeculae. Oh to be Superman, or at least a luminous red nova! Of course Superman is known for his blue leotards, too. Maybe he thought he could turn himself into a blue straggler instead of committing suicide, by effectuating a more gentle merger than the red kryptonite style one that did him in? Then again, since when does Superman want to be a straggler? Better go out in a blaze of red glory and light up the galaxy when you go!